Marsiell is a Hip-Hop artist out of Indianapolis who puts his life influences in his music. Surprisingly, this “STRIDES episode 2” EP is his debut (*For how strong it is, I would’ve assumed it was his second or third). This project is very clearly influenced by things of the 90’s as some popular 90’s cartoons are referenced throughout the project and even on the cover art. 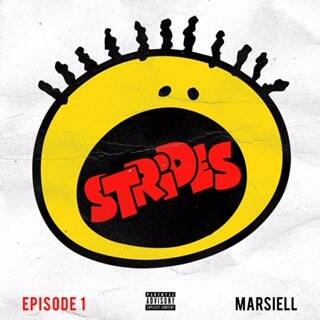 The first thing I will say about Marsiell after listening to “STRIDES episode 1” is that he 100% embodies true Hip-Hop. It’s clear to me that he is an above average rapper. His use of different speeds and flows along with his word play and punch lines show that he has thoroughly studied the art form. A perfect example of his skill as a lyricist can be found in this bar from track 2: “THC and Halle Berry” - “Kept the Sh*t ducked off, like watching Looney Tunes with no Daffy”. There are several bars in this EP that are on par with this one. Something about Marsiell is that he has the ability to sing on his own tracks. This is becoming more and more necessary as Hip-Hop is starting to transform. He also seems to have a solid ear for production because he used six different producers (one for each song) and all of the beats are dope. The subject matter of this project is rather mature and deep for it to be this man’s debut. He tackles several different topics such as politics, love and drugs and also speaks on some personal experiences. To me, this is necessary for longevity in the rap game as most of today’s new rappers only rap about money and material things. “STRIDES episode 1” is a mixture of smooth vocals, dope lyricism and strong production and it leaves the listener hoping that a full-length album is coming soon, or at least “STRIDES episode 2”.